​“During their 55 years of marriage, Joan & Richard Kimple’s favorite pastime was walking through parks and forests. They took long hikes in the Ottawa National Wildlife Refuge - though there were few visitor facilities at the time. Before the boardwalk was built, they searched Magee Marsh for additions to their life lists. They sat in the cold along Lucas-Ottawa County Road trying to spot kettles of hawks during the fall migration. My parents traveled to many top birding spots, but loved seeing birds at their backyard feeders and in the nearby marshes, fields and forests. Their enthusiasm for birding was contagious. They organized a bird study group, planned Earth Day celebrations and shared their library. Their two granddaughters joined the excursions at early ages, delighting in the birds, snakes and shells they encountered. The Wildlife Window at Ottawa National Wildlife Refuge is located behind the Visitor Center, and features an opportunity to view birds and wildlife on feeders, in shrub habitat, and in wetland habitats. The building is open sunrise to sunset, year-round. We are so honored to introduce you to members Daniel and Ruth Ann Fraser, who donated $4,000 on #givingtuesday to cover the cost of installing a canoe access point at the Turtle Creek Unit. "We first learned about ONWR when we heard there was a wildlife drive near Lake Erie where you could watch bald eagles. Daniel is originally from British Columbia, and growing up along the North Thompson River, had seen them many times, sitting in the trees while he and his dad paddled by in a canoe. 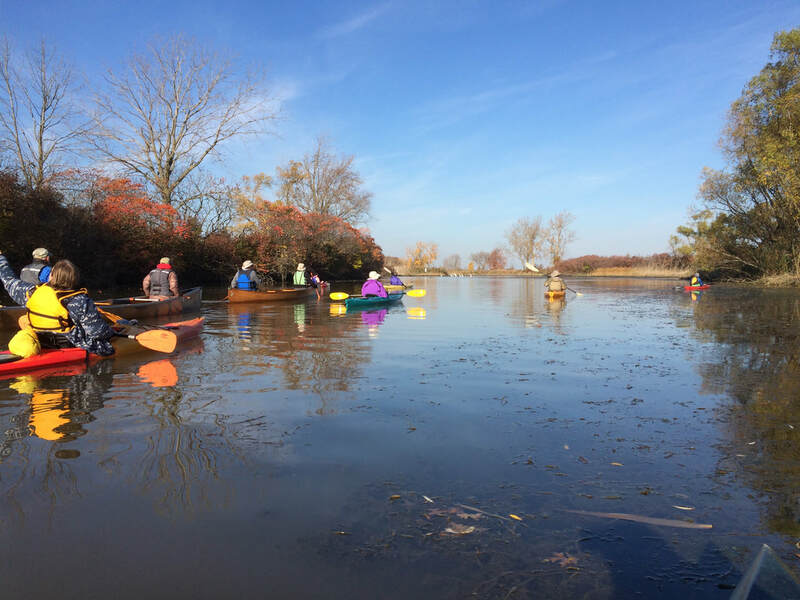 In 2016, we joined the Friends so we could take part in the first ever canoe and kayak event at the refuge, led by ranger Justin Woldt. Paddling along Crane Creek in the cedar strip canoe was such a great experience, allowing us to see parts of the reserve that are normally hidden away. That canoe is what led us to make our Giving Tuesday donation in memory of Harvey Fraser, Daniel’s dad and the canoe’s builder. Harvey never visited ONWR, but since there’s water and open sky, he would have loved it! He was an all-season outdoorsman, spending every free hour skiing in winter and canoeing in the summer. As a teenager, he helped build the famed wooden speedboats of Ontario cottage country, but the canoe was his preferred method of transportation. Harvey competed in marathon canoe races well into his 70s, and in his younger days was a member of the BC team that raced voyageur canoes across Canada in 1967 for the centennial of confederation. Everyone knew that when you visited the Frasers in the summer, you’d end up in one of the canoes Harvey had built in his workshop during a long, cold winter. In 2013, we drove to Kamloops where Harvey was in hospice care at the end of a long battle with cancer. At his request, we brought home to Michigan the cedar strip canoe that he had built in 2002. With it came many memories of past paddles, from Daniel’s high school graduation trip with his dad to the wild rivers of the Northwest Territories to a day trip here on the River Raisin in our backyard just a few years before. When the estate was finally settled this fall, we wanted to make sure that some small piece of Harvey’s paddling legacy would be remembered. So when we saw the ONWR was looking for funds to build a canoe access, we knew we had found the right place. Harvey enjoyed sharing his love of paddling with everyone he met, and we are happy to pass that opportunity along to others by making the new canoe and kayak launch on Turtle Creek a reality." We can't wait to work with refuge staff and get started on this project. Soon, you will be able to get out on the water to explore... and when you do, think of Harvey and his adventurous spirit. Words cannot express how thankful we are for Daniel and Ruth Ann for choosing to remember Harvey by funding this project. Check back often for progress updates for the Turtle Creek Unit Access!